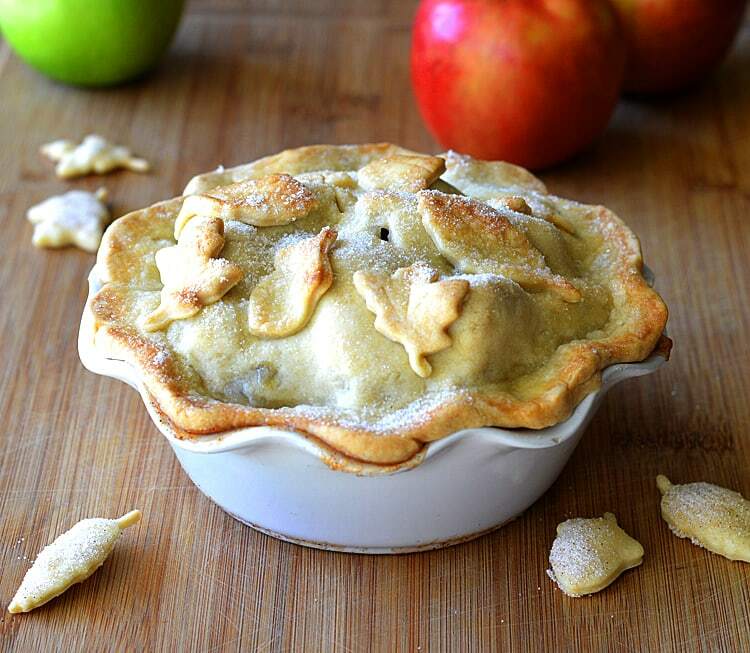 This dessert is as Easy as Apple Pot Pie … a little play on words, but this apple pie is more like a pot pie in that it only has a top crust. 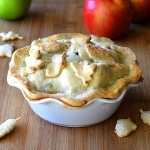 Traditionally filled with sliced apples and cinnamon spice, and topped with a single layer of pie crust. We used a combination of Granny Smith and Honeycrisp apples in ours, but you could use any combination of apples in season where you live. The spice mixture is cinnamon, nutmeg and allspice with a bit of cornstarch to thicken up the filling. The dish we used was only a 5″ round and this recipe is for a 10″ single crust. Don’t discard that extra dough! 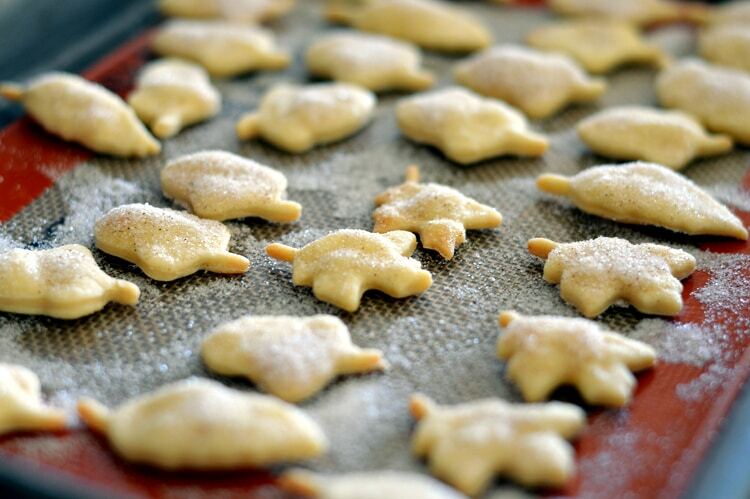 Kids (and adults) will enjoy these cutouts dusted with cinnamon sugar. To get the sugar to stick, we just sprinkled with water, but you could use almond milk, etc. You’ll need to bake these separately as the pie will, of course, take much longer to bake. These take just about 20 minutes. The amount of apples needed may vary based on the size. 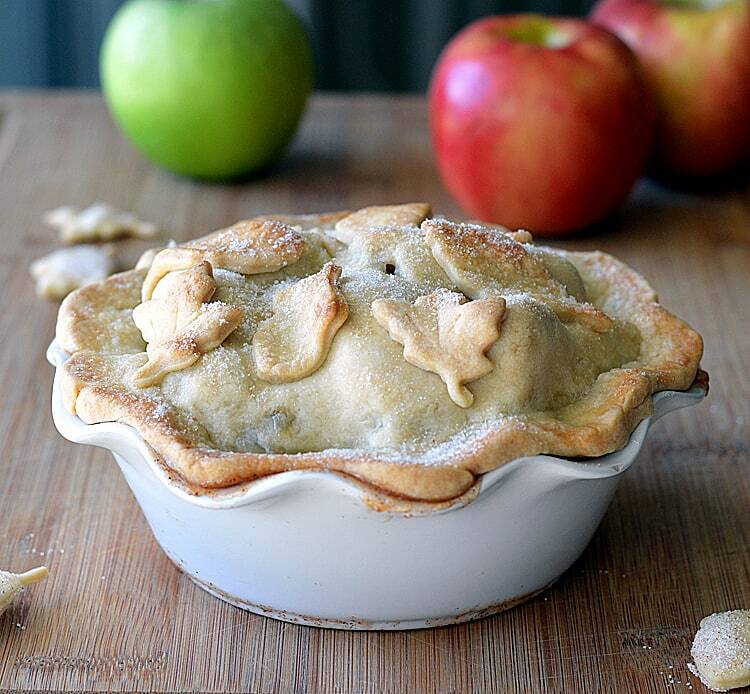 We used 3 large apples for this 5″ pie dish. Remember, you’ll want to mound them up high as they will bake down. We took some of those cutouts before baking and “glued” them onto our crust with a bit of water and dusted the entire pie with sugar. Bake until golden brown. Begin by making the dough for the pie crust. We are only using crust for the top of this "pot pie" style apple pie, so this recipe if for one 10" single layer pie crust. This should provide enough for a 9" pie plate plus leftovers to cut into decorations. Start by placing all ingredients into a food processor. Add 2 Tbl of the ice cold water (we used ice cubes to make it as cold as possible). If needed, add the third Tbl of water. Do not overwork or the dough will be tough. Allow to rest in the refrigerator for an hour. Peel, core and slice the apples placing into a large bowl. Immediately squeeze lemon juice on the apples to prevent them from turning brown. Toss the apples with the cornstarch and spices. Roll the dough to 1/4" thickness, working quickly. 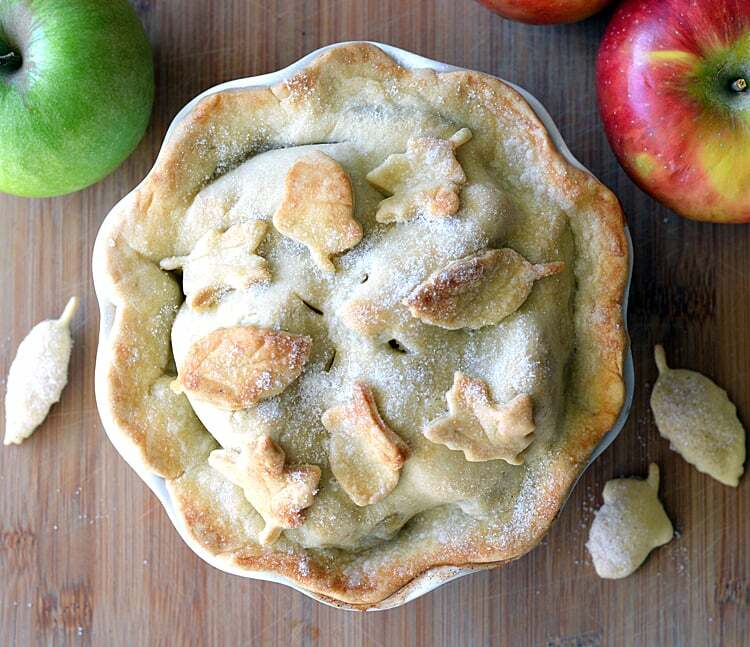 Place the apples into your baking dish and top with the pie crust. Trim the excess, crimping the edges. Re-roll the excess and cut out shapes for the top if desired. Using a small amount of water on your fingers, moisten the back of each of the decorations and adhere them to the crust. This is our "glue". Cut 4 vent holes into the center top of the dough. Gently and lightly mist the dough with water and generously sprinkle with sugar. Bake for 35-45 minutes or until the crust is golden brown. IMPORANT: Place a baking sheet under your baking dish of you will have a mess if it overflows during baking. This is gorgeous! Great recipe!